2 Towns Ciderhouse opened its new production facility in south Corvallis last March with two 6,000-gallon fermentation tanks and one 6,000-gallon “bright” tank for carbonating the cider. 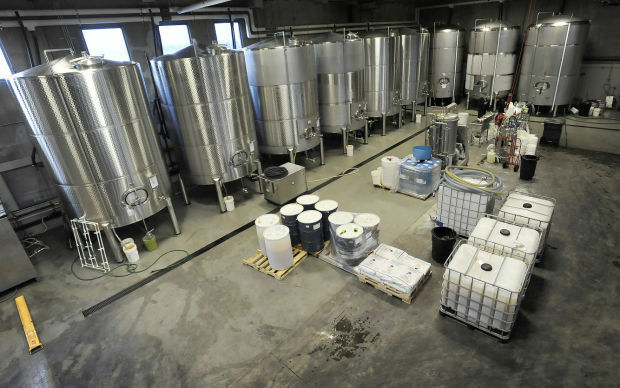 Since then, it’s added four more fermentation tanks and two more bright tanks. At the rate things are going, it won’t be long before the company will have to add even more production capacity. 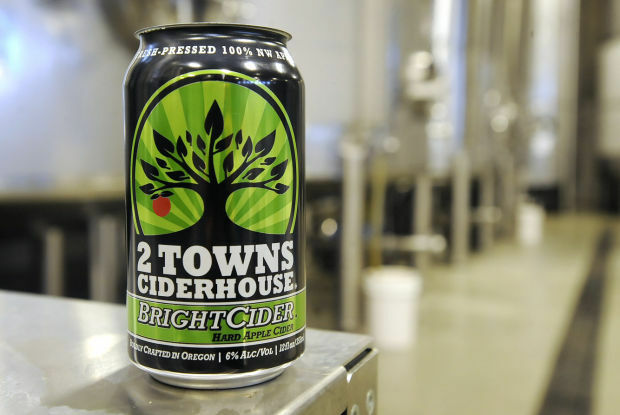 Americans are rediscovering hard apple cider, this country’s fermented beverage of choice before being overtaken by beer in the early 1900s, and 2 Towns is right at the forefront of that trend. According to the latest sales data from IRI, a Chicago-based market research firm, the Corvallis cidery is now one of the top 20 producers in the nation. IRI figures for the 52-week period that ended Dec. 28 show 2 Towns in the No. 16 position with just under $1.5 million in sales, up 153.7 percent from the previous year. Larsen says he is “humbled” by the ranking but adds the company intends to stick to its artisanal roots, using only fresh-pressed Northwest apples and other natural ingredients with no added sugar or flavoring agents. “Not only is that really cool, just being on that list, but being one of the very few independent and craft producers on that list,” he said. Indeed, the IRI sales rankings are dominated by corporate cider brands. Angry Orchard, at the top of the heap with $214.5 million in sales — a whopping 56.74 percent of the U.S. cider market — is owned by Boston Beer Co., the maker of Samuel Adams Boston Lager. No. 2 Woodchuck Cider, with $38.1 million in sales and a 10.07 percent market share, is a well-established national brand owned by C&C Group. Tempted by cider’s growing acceptance among U.S. consumers, some of the world’s biggest beverage conglomerates have jumped into the category, with recent entries such as Smith & Forge (from MillerCoors Brewing Co.) and Stella Artois Cidre (Anheuser-Busch InBev) carving out spots in IRI’s Top 10. That’s OK with 2 Towns co-founder Aaron Sarnoff-Wood, who considers mass-market brands an entry point that can lead customers toward artisanal products like his. 2 Towns remains well down the list from the big boys with a 0.39 percent sliver of the overall market, valued by IRI at $378 million. But the Corvallis company has undeniably grown rapidly since its 2010 launch in a local garage. 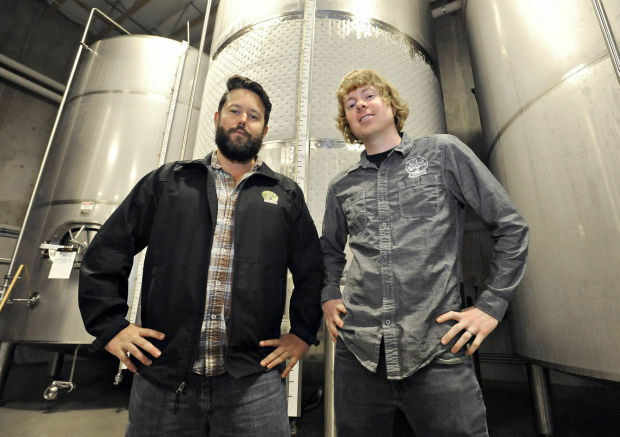 The venture has roughly doubled its production each year, graduating from its cramped startup space to a gleaming 10,000-square-foot cidery and taproom in 2012 and adding the 15,000-square-foot production facility in the Corvallis Airport Industrial Park last spring. The staff has grown as well, with the work force now numbering 26 employees, including a sales rep in Washington state and two to serve California’s fast-growing markets. Last summer, the company diversified its product offerings by packaging some of its ciders in 12-ounce cans. 2 Towns recently expanded its California reach with the addition of Bay Area distributor Morris Distributing and added its first-ever distribution deals in Hawaii, Alaska, Idaho and Nevada. Larsen said the company has room to grow in place and remains open to expanding into more new markets, but for the near term it plans to focus on broadening its West Coast base by getting into more pubs, stores and bottle shops in Washington and California.